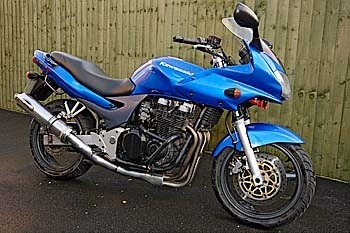 After recently passing my direct access test, I have today purchased my first big bike. 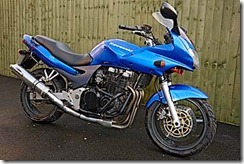 Namely a Blue 2002 Kawasaki ZR7-S. I was really looking for a Suzuki Bandit 650 but we couldn't find any about and I didn't want to wait, so I went for the Kawasaki. It had about 30,000 miles on the clock and the rear shock was a bit tired and the brakes aren't the best, but for a first big bike I can't fault it and would recommend one to anybody starting out. But they are quite rare. Anyway I got on with it straight from the off, the only minor problem I have with it is the alarm runs the battery down fairly quickly and the manual choke is a nightmare.